For data wonks, some new information has become available (hat tip: Franco) from Eurostat. Page 53 shows "offshore financial centres" taking up 18% of the EU's outward stock of foreign direct investment and about 22% of inward FDI stocks. But take a closer look and you see that the column next to the "offshore financial centres" is Switzerland, which is, by most people's reckoning, an "offshore financial centre". Switzerland adds a further 14% and 13%, so we have a total of 32% and 35% respectively for "Eurostat-defined offshore financial centres plus Switzerland." But the problem is still bigger. Like every study this area, this report reflects a narrow view of what an offshore financial centre is. 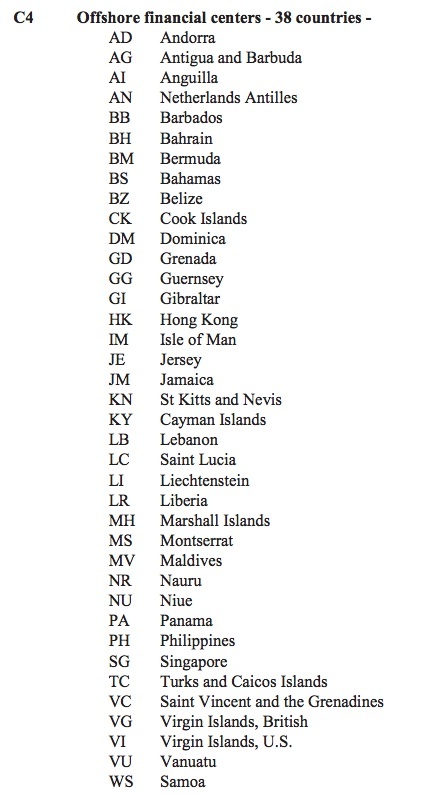 Eurostat cites offshore financial centres as "an aggregate composed of 38 financial centres across the world, including, for example, Andorra, Liechtenstein, Guernsey, Jersey, Bermuda, the Bahamas, the Cayman Islands, Panama, Bahrain, Hong Kong or Singapore." (Click on the picture to enlarge and view this Eurostat list from 2008, which we presume is the same 38 as used in the latest report.) But according to our way of looking at the world, there are 60 such places, with more arriving all the time. And let's not forget that Europe contains some of the world's biggest tax havens, or secrecy jurisdictions, such as the Netherlands or Ireland, which aren't included in these numbers; or that we, along with many practitioners in the field, consider the United States to be a secrecy jurisdiction. Whichever way you slice the numbers, this data underestimates the scale of the problem.